After WWII, my dad went to work as a farmhand for a man named Henry. Henry owned a small business or two besides the farm. Henry tended to let his employees handle things, as this allowed him to come and go as he pleased. He was no stranger to hard work, and my dad spent a lot of time working with him, but Henry was known to simply disappear on short notice and be gone for weeks at a time. To use a general term, Henry was what we would probably call an “outdoorsman”. If he heard fish were biting in Missouri or moose were spotted in Canada, he would be gone and take only what supplies were in his car trunk or truck bed. Henry died a few years before I was born so I never knew him, but he sounded like he was like the local Ted Williams when it came to the outdoors. I doubt there was a fish he had not caught or animal he had not hunted within 15 states, and he had hit other states and Canada pretty hard also. It was a pretty exotic thing to hunt and fish in other states at that time, so he was a regular celebrity among the local hunters and fishermen. In addition to hunting and fishing, he would head off on other adventures. He would take a boat down a river just to see what was there. When the Alaska Highway opened, he took a trip up there in his Ford pickup and drove it for fun (it took him weeks). I remember when I was little, peeking into the windows of his abandoned house and marveling at the trophies hanging on the wall, especially the moose that looked as big as an elephant to me. There may not have been ten heads on that wall, but it seemed like a huge collection to a four year old like me. My dad never cared very much for hunting or fishing so had little interest in Henry’s field exploits. But later, something would remind dad of Henry when we were out working on the farm and he would share a story. I’d always pump dad for information about Henry’s hunts. “Where did he shoot the moose? What kind of guns did he have”? But he wouldn’t have many answers since he really wasn’t interested back then. But one time dad remembered something about “some gun” of Henry’s. He said Henry had talked about a “.348”. Dad remembered that number only because an uncle had a Chevrolet around that time with a 348 engine. I don’t know if I knew anything about a .348 caliber at the time, but I later knew there has only been one .348: the .348 Winchester. If that isn’t enough to narrow down what Henry had, only one rifle was ever made to chamber it- the Winchester Model 71. Yes, the only rifle to use the .348 was the Model 71. Also, the .348 Winchester was the only caliber the 71 was made for. You don’t see that much. What a fitting rifle for an outdoorsman. In my opinion, the Winchester 71 has to be the most “outdoorsy” looking rifle ever made. By the way, the paper stuck in the RH pocket of the shirt is my dad’s “Veteran’s Permanent Free Permit” from the state of Indiana. Basically, it is a free lifetime hunting and fishing license given to war veterans. There is a place on the back to check off whether the bearer is a veteran of WW I, WW II, or the “Spanish War”. I don’t know if such a permit still exists for veterans- I have not seen any mention of them- but I think they should. The 71 is a modern rifle as Winchesters go. Winchester introduced the Model 71 in 1935 or 1936, depending on where you read about it. That sounds like a long time ago now, but one has to realize it was one of the very last lever actions from Winchester. The 1886 is one of their later lever actions, and the 71 came out 50 years later. Some think the 71 is the ultimate refinement of Winchester’s lever actions. The 71 was not a completely new action at all. It was based on the large 1886 lever action. The 1886 was chambered for the big blackpowder cartridges like the 45-70, 45-90, and 50-110 and was made from 1886 until 1935 or 1936. These years are approximates since Winchester start and end dates from that period get a little fuzzy. They would assemble rifles from parts for years after dropping some model from the catalog, and new models often took a couple of years for production to really get going. While the 71 is an updated 1886, the very late 1886s had many of those same updates, like a coil hammer spring. There were some other changes to make the 1886 into the 71, like a reshaping of the locking bolts and a slight geometry change of internal parts to give a smoother action feel (but also shortening the bolt travel a little, reducing max cartridge length). Those locking bolts went straight up and down on the 1886, but are slanted slightly rearward on the 71. This makes the action feel a little smoother, but it has another effect. When you get close to maximum loads that start to push back against the bolt more than normal, it will tell you by giving the lever a little “pop” you can feel. The 71’s .348 cartridge was sort of an update too, supposedly intended to be a more powerful version of the .33 Winchester round that was introduced for the Model 1886 in 1902. The .33 Winchester was the first smokeless powder round the 1886 was chambered for, and required a switch to a Nickel Steel barrel to contain the higher pressures. 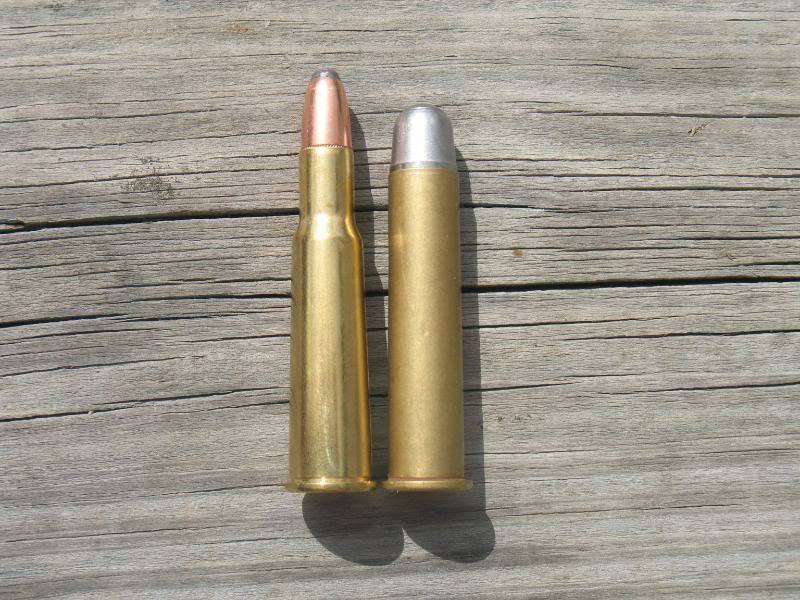 Both the .33 and .348 used a 200 grain bullet (.338″ diameter in the .33 Win and .348″ diameter in the .348 Win) but the claimed velocity of the .348 was over 500 fps faster (2530 fps vs. 2000 fps). .348 on left, .45-70 on right. That’s all nice, but why on earth would Winchester choose to update a caliber that seemed unpopular compared to the 45-70 and 50-110 that were accepted then and still well-known today? Why not use a Nickel Steel barrel and action and load the 45-70 hotter, for example? To get the answer, one has to realize there was a battle going on inside Winchester at the time. While some in the company wanted to hold onto the lever actions and cartridges that made Winchester what it was, a lot of others wanted to get away from anything that sounded old-fashioned. A lot of changes were underway at Winchester at that time. They had already dropped the “1800” part from model numbers (the Model 1886 became the 86, the Model 1894 became the 94, etc). The super fast .220 Swift cartridge had just come out, and the .270 Winchester had been a hit since 1923, so velocity was in. The ultra-modern Model 70 bolt action was due any day (and was actually supposed to be out before the 71 but it didn’t work out that way and the 71 beat the 70). The Old Guard at the Winchester factory was losing out to the “modernizers”. The days were numbered for the old classics, including the 1886. The 1886 looked old. The blackpowder-era cartridges it used were old. My opinion, and that’s all that it is, is that a compromise of sorts was made. You might even call it a sacrifice. The big 1886-type lever action could survive, but only in a modernized form, with a new model name, and with a jazzed-up cartridge. Something that “fit the image” Winchester wanted. The Model 1895 was dropped around this time also, so the 71 would effectively replace two rifles. In dropping the 1886, Winchester stopped making rifles that used the .45-70 and other medium and large blackpowder cartridges. The loss of the similar-sized 1895 didn’t mean Winchester dropped all of the 1895’s chamberings, but it did end their production of a lever action rifle in those calibers. 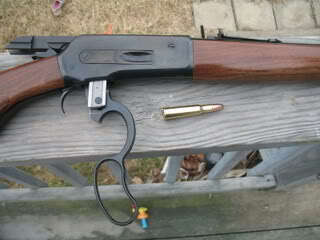 The 71’s .348 cartridge would have to replace just about everything in a Winchester lever action larger than the .30-30. That was a big case of streamlining the lineup. Winchester also streamlined the options. Whereas they used to offer each rifle in several calibers, in various grades, choices in stock design and wood, trim levels, barrel lengths, etc, they didn’t give you much choice in the 71. You could have it in Standard or Deluxe grades (the Deluxe had nicer wood, checkering, sling and swivels), and could get either grade with a 20″ or 24″ barrel. You only had four choices with the 71. That’s it. Four. By the way, although people call the 20″ Model 71s “carbines”, Winchester didn’t. They considered them both “rifles”, but with different barrel lengths. The 1886 had gotten some streamlining of it’s own in the last few years of it’s existence. You can almost tell when an 1886 was made by weighing it. Barrels started out long, heavy, and octagon shaped with minimal or no taper, then got shorter and more slender as time went on. Rifle weight dropped accordingly. They added a Lightweight Model, then an Extra Lightweight. The stocks had started to change shape also, but at a slower pace. This stock change was more a styling change than a weight and bulk reduction, but combined with the trimmer barrels, made for a faster handling rifle for some. Along with reducing weight, the changes made them look more modern, and Winchester carried this over to the 71. And the 71 got the full treatment. It got a stock and forend design that many credit to an NRA design team headed by Townsend Whelen. The stock and forend are heavier than those of most lever actions. The stock not only has a pistol grip, but has a straighter, higher comb. The comb has a broader curve instead of tapering to a narrow top. I’ve heard some say this whacks their face more than an ’86 in recoil, but others say it’s width and gradual curve makes the blow easier to take. The buttplate is flat checkered blue steel, which may not be as traditional as a curved buttplate, but it doesn’t have pointed tips to snag clothing when snapped to the shoulder or to penetrate into the shooter’s shoulder when fired. The forend is wider than usual for a lever action, just wide enough to keep it from feeling like holding a broomstick like many lever actions, yet not too wide. There is no Old West barrel band around the forend, it having only a blued steel cap. 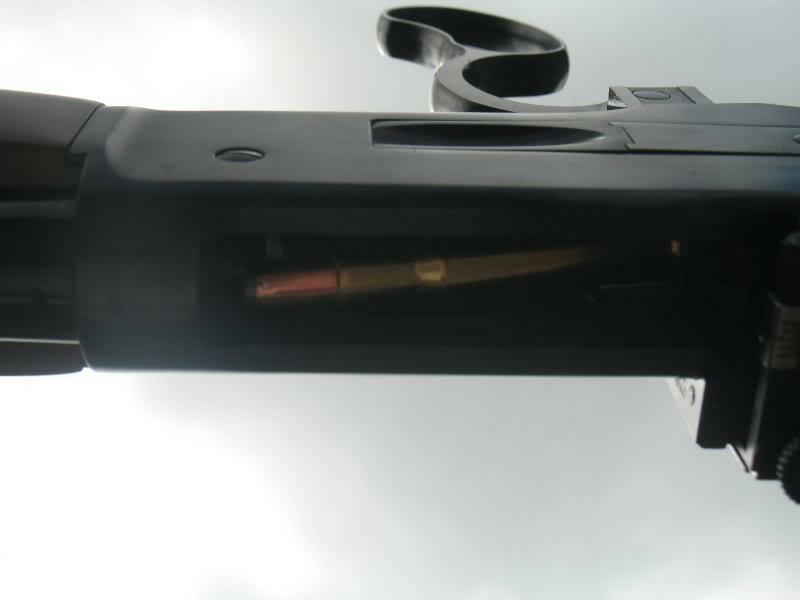 The magazine tube is approx two-thirds the length of the barrel rather than running completely out to the muzzle. A full length magazine tube on a big rifle adds weight out front that is nice for standing still and taking a deliberate shot, but can make it more sluggish in close range work…where this one is intended to be used. That magazine holds four rounds, making the 71 a five-shooter. While I think the 71 is one of the best looking rifles ever made, and few would question it’s strength and dependability, I am not entirely sold on it’s .348 cartridge. I think it’s a great round, powerful and capable of knocking down anything in North America. On the other hand, I have a hard time thinking of anything it can do that a 45-70 cannot. What I do like is the cartridge’s shape. It isn’t a short fat benchrest-type case we are told we must have today in order to get that .001″ smaller group. The .348 is shaped for it’s purpose of hunting things that can eat you. In designing the .348, Winchester started with the .50-110 case, which had the largest head and rim of any rimmed lever action cartridge. The rim is only a couple of thousandths larger than a 45-70’s but the actual case body is slightly larger. The .348 has one of the most rapidly tapering bodies of any cartridge made. Starting at that big base, the case body tapers quickly to the shoulder. This is the important thing, I think. It makes it almost funnel-shaped, and the chamber is naturally a mirror image of that. The case goes into the chamber easily, and it comes out easily. Compared to a typical cartridge and chamber, it’s more like dropping a tapered plug into a matching seat instead of slipping a cylinder into a hole. It will feed. It will extract. The body taper difference should be apparent. It is also easy to load into the rifle’s magazine. The slick tapered case slips easily into the side loading gate, aligned and guided in by the groove machined into the gate. Not that the straight-sided blunt-bulleted cartridges are hard to load, but the .348 seems easier. You can load a 71 without looking after only a little practice. Yes, I have a 71. I wanted one, and it was bound to happen sometime. Mine is not an original Winchester however, but a Browning reproduction. Browning made them for less than a year across 1986-1987 only, and in similar variations as Winchester. Browning made Standard and High Grades and made each of them in both 20″ and 24″ barrels. Like the original Winchesters, the 24″ barrel appears to be more popular. Winchester dropped the 20″ barrel after about ten years of lackluster sales. The Browning sales went similar. They made fewer 20″ rifles to begin with, but if I remember right, they took longer to sell. Used Brownings with longer barrels sell quicker than the shorter ones, and sometimes for a little more money. Used Winchester 71s sell for stupid money no matter what, so I don’t pay that much attention to which length brings more. But if 20″ barreled Winchesters sell for more, I’d think it is due to relative rarity and not actual preference. I don’t understand that. With a rifle meant for close, fast work, I’d want the shorter barrel. And I don’t think the 24″ barrel would give that much more velocity either. I wanted one with a 20″ barrel. I found an unfired 20″ Browning 71 that other people were passing up because it didn’t have the 24″ barrel, so I contacted the seller with an offer and he took it. It was brand new, still in the box with the papers and plastic wrapping it came with in 1987. What a shame. I had to fix that. It is one of the most “solid” feeling rifles I’ve ever handled. I own a Winchester 1892, which is sort of a scaled-down, pistol-caliber version of the 1886 and 71 action. The 1892 is pretty slim and trim. The 71 action looks just like it, but seems really wide and hefty in comparison. The 1892 and 1886 are some of the smoothest actions around, and the 71’s slight internal changes supposedly improved on that. Part of the reason my 1892 is so slick cycling is from being worn. My 71 came out of the box it had been in for 20 years and was tight as a drum, but it was really slick in spite of not being “worn-in”. The 71 is one of the strongest lever actions made, if not the strongest. When Harold Johnson of Cooper Landing, Alaska made his .450 Alaskan and .50 Alaskan conversions 50+ years ago, he used Model 71s. I’d guess more than a few of the new Brownings were bought with the plan of converting it to one of the Alaskan cartridges. Although big and strong, it handles nice. Overall length with the 20″ barrel is 38.25 inches (shorter than an M16A1 or A2) and it weighs 7.8 pounds. It seems heavier than that, but it may be more of a visual illusion caused by it’s beefiness than anything. 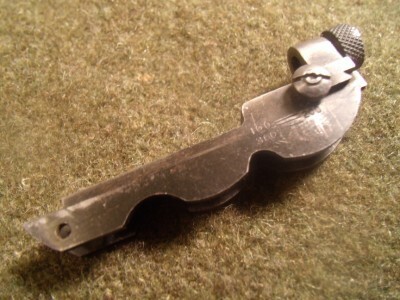 The balance point when empty is right on the front half of the receiver, where it’s rounded to fit the hand for carrying. It shifts just a tiny bit forward when loaded, but the balance point is still on the rounded part. I have never handled a 24″ barreled 71 to see, but I would think the balance point would be farther forward. The barrel is what I would call medium-heavy, so another four inches should add noticeably to the front end, and I don’t think that’s a good thing with a rifle of this type. As it is with the 20″ barrel, it has plenty of muzzle weight to hold steady in standing. Any more might be a little too much. That’s only speculation on my part, but I am glad I got a 20″ barrel. I have heard that Model 71s shoot well. I think mine shoots pretty well, and better than I expected. I have a terrible time seeing open sights, so I mounted a Lyman peep sight on the rear, and replaced it’s aperture with a Merit adjustable iris aperture. I can set the Merit’s aperture at an opening that sharpens the front sight’s appearance. This is fine for targets, but I would remove the Merit aperture completely and go with the sight’s wide open threaded aperture receptacle for hunting. The available ammunition bears some mention before I get into the shooting. There isn’t a huge choice of either loaded .348 Winchester ammunition or bullets to handload. Winchester offers loaded ammunition with a 200 grain Silvertip bullet, and Hornady makes a good 200 grain soft point .348 bullet for reloading. Brass is available on a “seasonal basis” from Winchester, which means they make some when they feel like it. That covers the most common supply. That’s it. There is more, but it isn’t exactly abundant. you can get loaded ammunition from Buffalo Bore, using a 250 grain bonded jacketed flat nose at 2250 fps…and running around $80 for 20. Barnes makes some .348 diameter bullets in 220 and 250 grain, plus they have made 165 grain bullets that seem to come and go from the lineup. DKT and other custom makers make bullets also. And then there is casting. Luckily, some guys around here play with revolvers in Linebaugh calibers that use a cut-off .348 Winchester case, so the local gun shop had .348 brass in stock. I ordered a few boxes of Hornady bullets to start with. I think the 200 grain bullet is about right for the .348. 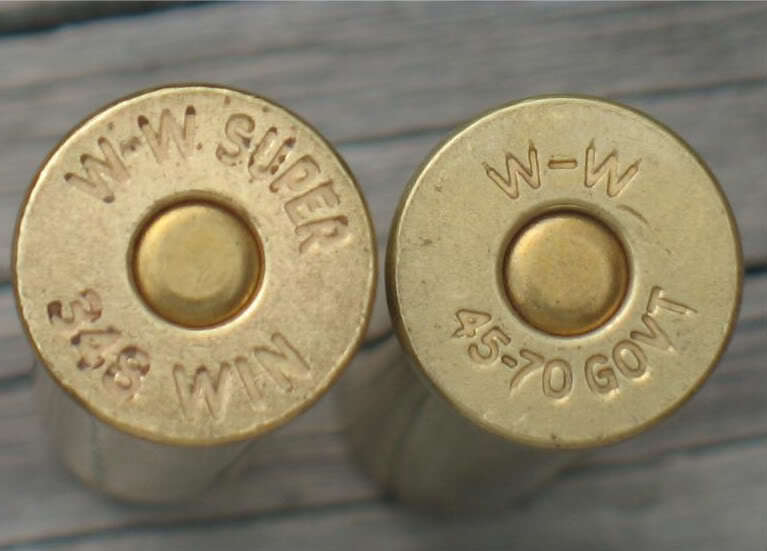 Apparently others thought so over the years too, since Winchester has made .348 ammo in 150, 200 and 250 grain bullet weights at various periods, with the 200 always being most popular and the only one they have made in decades. Remington used to make ammo for it, but not for a long time. With the Hornady 200 grain jacketed softpoint, my 71 makes five shot groups in the 2 to 2.5″ range at 100 yards. I’ve had several groups run a little under 2″. Nothing has shot really bad, and I don’t recall anything reaching 3″. These loads are running in the 2200 to 2500 fps range. That is pretty much my accuracy limit with metallic sights, so it’s probably capable of doing better. 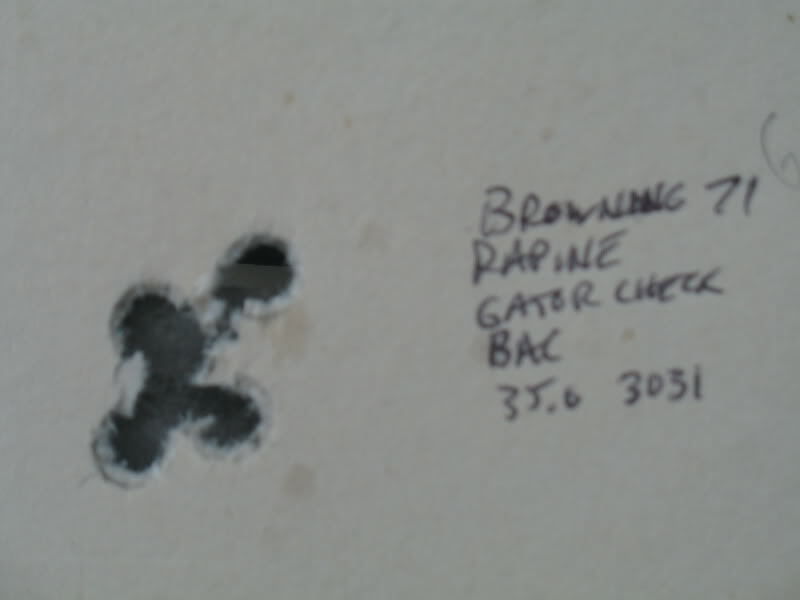 I started casting bullets about the time i got my 71, and the .348 seemed a natural for cast bullets so I got a mould from Rapine Moulds designed to make a 235 grain gas checked bullet. These bullets run closer to 240 grains made from wheelweight alloy, lubed, gas checked, and ready to go. I tried them at 50 yards at first since I didn’t know where they would impact with my sight settings, and the first load tried gave 1.25″ groups at just a little under 1800 fps. A guy who makes gas checks asked on a forum if anyone had a .348 rifle to try some new checks he was making, and I volunteered. With the load unchanged except for his gas checks, it made back-to-back ¾” groups at 50 yds. Nothing to complain about there. I have read many times that the 71 will pound the shooter with recoil. At first, you might wonder why it would be any different from a 45-70, and should in fact be less. But while the 71’s .348 is shooting a lighter bullet, it’s shooting it faster. Remember, we are right up against .30-06 speeds with a heavier bullet. The recoil impulse from a 400 grain bullet at 1700 fps will be different from a 200 at 2500 fps. It may feel better or worse, and that will depend on the shooter’s idea of recoil. Myself, I’d usually prefer to shoot a heavier bullet at a slower speed. Sharp, quick recoil bothers me a lot more that a heavy slamming push. The worst pounding I ever got was from a 7mm Remington Magnum, and this includes comparing to 45-70s and 375 H&H Magnums. The 71 will smack you at the bench, but it isn’t terrible. It’s not bad at all when standing. I think it’s about even with my Marlin 45-70 (which has slightly less weight) shooting 300 grain bullets at 1900 fps and 400 grain bullets at 1600. The 45-70 using 425s at a stiff 1650 fps are worse than anything I’ve tried in the .348. My (heavier) Trapdoor Springfield 45-70 shooting blackpowder loads (500 grains at 1200 fps) is a lot milder than either. Another thing I have read about is the 71’s reliability. I have heard it said that they will feed when held at any angle, including upside down. Some lever actions can be funny when operated at odd angles, and upside down is out of the question since they would allow the fresh cartridge to fall right out the top. The 71 is a little different. Why would it matter, and when would you operate it upside down? I don’t know. I suppose if a bear was sitting on you, you might have the need. Regardless of whether I needed to know, I wanted to know, so I tried it. It does indeed work when held at all angles, including upside down. I said earlier that old gunwriters have called the Wincheser 71 the ultimate refinement of the Winchester lever action. I have to agree. For the last gasp of the breed of big Winchester lever actions, they made sure to do a good job with it and send the big levergun out with honor. OK, so it’s a fine rifle. But what is it for? Like I said earlier, I still don’t see what the .348 Winchester will do that a 45-70 will not. The .348 should be flatter shooting, but so are a lot of rifles/calibers. Is a flatter trajectory even much of an advantage here? Maybe it will penetrate deeper when loaded with a strong constructed or “solid” bullet? I have no answer to that one. Something that i find interesting is that, on paper at least, when you look at typical 30-06 loads (not the recent Light Magnum or Extended Range type ammo) the .348 compares pretty well. In equal bullet weights like 165, 200, 220 grains, the velocities are so close as to be the same. The 30-06 will shoot flatter due to bullet shape, but not by a lot until you get well beyond sensible hunting rifle range. I do think the .348 has a case shape that will feed if anything will feed at all, and that can be worth a lot. In fact, it could be worth everything. I think what it is, is a great medium bore, short to perhaps mid-range rifle cartridge. And that quite honestly covers most big game hunting situations. I would feel fine using one for anything from wild boar to bears. I’d rather have something bigger for really big bears, but let’s face it: That will never be a common use for me, and probably won’t be for most other people either. I tend to think of it as a bigger-bored .30-06, or a .35 Whelen for lever actions. And that isn’t bad. Winchester used the Model 71 to replace two rifles, and it’s .348 cartridge replaced several calibers ranging from the 30-40 Krag to 50-110. That is a huge spread. It is impossible for a single cartridge to perform as well as each of those cartridges did in their area of expertise. Anything with the power of the .45 and .50 bores cannot have a very flat trajectory unless loaded so heavy the recoil would be murder. The flatter-shooting .30 calibers can’t develop the energy of the big ones, and will never have the bullet weight. If you had to find something to cover all these bases, the .348 does pretty well. It looks to me however, that the 71 ended up being more of a specialty rifle than a do-all rifle. People who bought them, and there weren’t that many, bought them with a specific use in mind: Hunting mean animals in tight spaces. 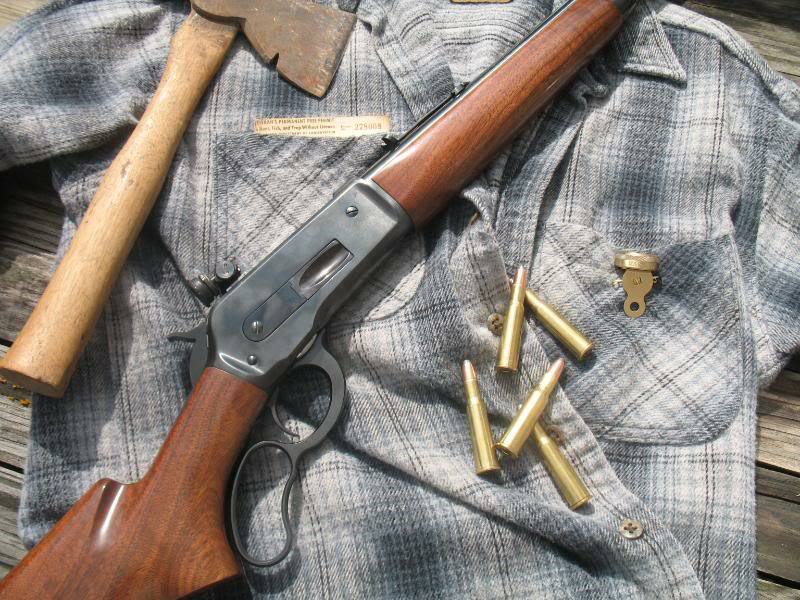 During it’s production period of 1935 to 1958, Winchester made 47,254 Model 71s. Over the same period, they sold over 1.1 million Model 94s. One M71 for every 23 M94s sold. But I don’t blame that on any perceived fault of the 71 in particular. Over the last 20 years of the 1886’s life, they only sold a little over 14,000 of them, and just over 29,000 1895s. The big lever action had ceased to be a huge seller before the 71 came along, and honestly never was. From reading old gun and hunting articles I think a lot of people wanted a 71, but couldn’t justify it. I have my 71, just as Henry had his. I would have been interested in the Model 71 even if I never heard of Henry, simply because it’s an interesting rifle. But knowing Henry had one, I find both the rifle and the person more interesting. I may never drive the Alaska Highway (I did plan to once, but it fell through). I may never take off for weeks at a time after moose or bear either, but I have the same type of rifle Henry used for that. I never met the man, but I think about him whenever I see or shoot my 71. Update: I just read that Swift bullets is, or will be, making a .348 bullet in their A-Frame (similar to the Nosler Partition) lineup. I have not heard the bullet’s weight, but have an email out. I have no idea why they would do this, since there can’t be much of a market, but I’m glad. I’d think that would be one good bullet whatever the weight. I had forgot that Winchester announced last winter they will be making a limited run of 71s (Miroku-made) this year. I don’t pay much attention to Winchester’s Limited Editions because they can’t get regular production models into my gun shop so I never expect to see any of the Limited Editions. It is on the website, but you have to look for it. I’m happy they are offering them, but will complain anyway. It’s pushing $1500, available only with a 24″ barrel, and has that tang safety they keep adding to lever actions. I’d watch Gunbroker for a Browning at around half that, with no tang safety and a choice of barrel lengths. The Winchester website’s new 71 specs remind me of something else. They say it is drilled and tapped for a receiver (peep) sight. I have seen a question on forums asking if a peep sight can be had for Browning 71s. This question stems from sight makers not listing the 71 in their charts. 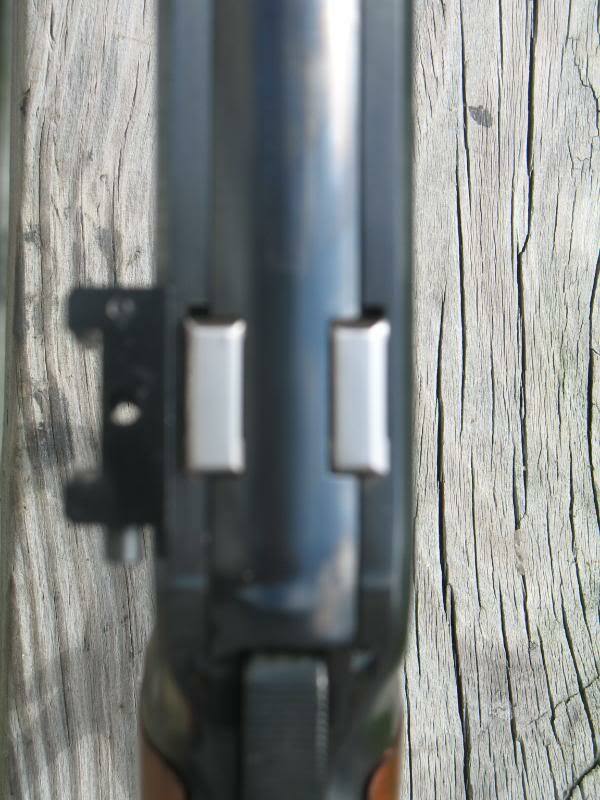 I am not sure if Winchester drilled and tapped many (or any) original 71s for receiver sights- I have seen them that were not. So you can see why there might be some doubts as to what could work. Being the same basic action as the 1886 and seeing mine was drilled and tapped, I hoped a sight made for the 1886 would fit. I ordered a Lyman 66 sight for the 1886 and it fit just fine. So there is the answer- an 1886 receiver sight works, as I suspected. Winchester did make a peep sight of their own for the 71. It pinned into the bolt itself, behind the extractor, and was a fairly compact slick arrangement. It was called the Model 98A Bolt Peep sight (Similar 98 variations were made for other Winchesters). These sights bring a bunch of money by themselves. I saw one on eBay last week and it brought $428.